It's July yet Back to School is already on our minds because the new school year starts up in August which is fast approaching. Why does summer go so fast? It seems like just yesterday I was stocking up on flip flops, shorts and sunscreen and now I have to think about school shoes, back packs, school supplies and school clothes. Does your "Back to School" shopping gets as expensive and tedious as mine? If so, I have a treat for you today! The folks over at OshKosh B'gosh (one of my fave stores for the Lil Divas) contacted me about sharing their Back to School Looks with my fab readers and I jumped at the chance. Why? OshKosh B’gosh has great back to school clothes that are affordable, durable and will send your kids to school in style. Plus all their clothes are available online and in-stores. 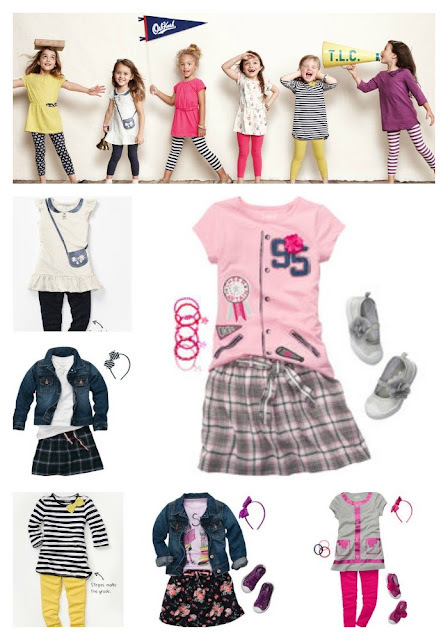 Back to School clothes should be comfy, stylish, durable and affordable. We shouldn't have to break the bank to keep our kids looking good at school. That's why I like to fill the Lil Divas closet with simple basics like OshKosh's tunics and leggings that come in many prints and patterns to mix and match for tons of combinations. Let's not forget the colored jeggings in the skinny fit girls love. They are bold and beautiful with an adjustable waist for the perfect fit! Being able to mix and match means more bang for your buck as you get greater use out of each piece of clothing. I don't know about you but that means a lot to this thrifty mama. I love a bargain but I love it even more when I can get lots of use out of the purchase. 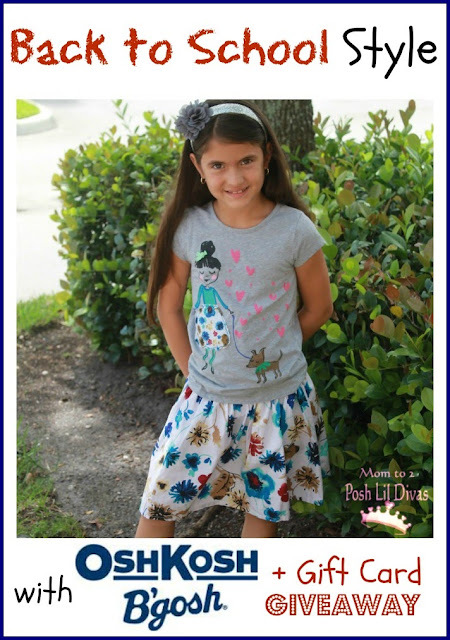 The Lil Divas love OshKosh's twirly and girly skirts and skorts (with built-in shorts - yay!) in florals, plaids, denim and much more! Whatever the look you go for, you can complete it with OshKosh slip on sneakers or Mary Janes. Check out the TLC Shop with updated designs for fall. I shared a few of our faves in the photo below. Even though we're a girls only household - I can't leave the boys out! OshKosh's Heritage hoodies for boys have a roomy fit for easy layering over button front shirts and tees. Fun, bright colors and the OshKosh B’gosh logo make this hoodie a classic piece your boys will wear over and over again. Plus, have you seen their new Skinny Denim for Boys – they are washed down with a hint of stretch for comfort and available in river dark rinse, indigo, cement and bright blue. Now that I've shared my fave back to school looks with you. I'm going to let you share your fave look with me (and you can enter to win a $50 OshKosh gift card in the process!). 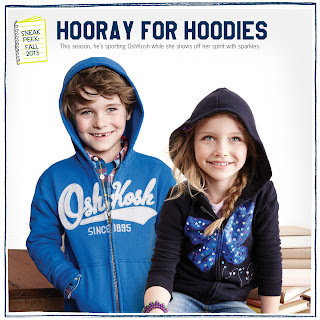 Are you ready for a Back to School OshKosh B;gosh gift card giveaway? Check out the Rafflecopter below for all the details. Giveaway ends 7/30/13 at 11:59 p.m. EST and is open to US residents. Please see our official sweepstakes rules before entering. Thank you. Good luck and don't forget to follow @oshkoshbgosh on Twitter and OshKosh B’gosh on Pinterest for outfitting ideas, vintage ads, deals and special events! Good luck getting ready for Back to School! Disclosure Statement - OshKosh B’gosh partnered with bloggers such as me to help promote Back to School Looks. As part of the program, I received product or gift cards. OshKosh B’gosh believes that consumers and bloggers are free to form their own opinions and share them in their own words, and therefore did not tell me what to purchase or what to say about the products I used. OshKosh B’gosh policies align with WOMMA Ethics Code, FTC guidelines and social media engagement recommendations. The winner of any giveaway in this program will be randomly chosen and gift card fulfillment will be handled by a third party. I love the Beauty and the Brains outfit! Super cute! Love the "Straight A" with yellow leggings and black and white stripped tunic! So cute! 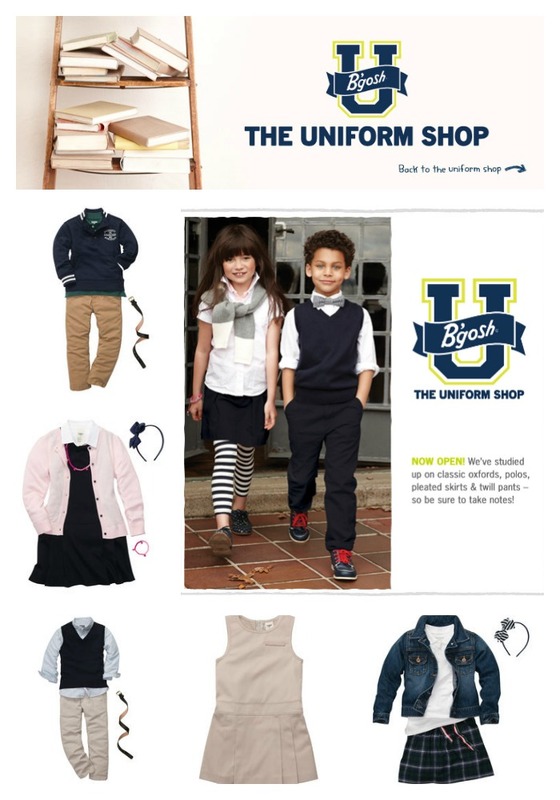 We'll be using the uniform shop to help get us ready for school this year! http://www.carters.com/null/Hoot-Couture/Hoot-Couture-baby,default,pd.html love this for my baby girl! Love work of art for my little artist! I like the Pumped up Pink outfit for my daughter when she starts Kindergarten. I loce the Class President. The Navy 101 is so cute! This outfit would look beautiful on my daughter. Thanks for the chance to win! I think this http://www.carters.com/null/Ruffle-Berry/Ruffle-Berry-baby,default,pd.html?cgid=oshkosh-baby-girl-outfits&start= is just precious! It's cute and fun! How lucky for me that I found you on Google+.